Aiming to capture the pioneering spirit of the Davis Farmers Market and its role within the community, author and market co-founder Ann M. Evans published the Davis Farmers Market Cookbook in 2012, sharing 75 market-inspired recipes that encourage readers to shop and eat their way through the vibrant seasons of Davis, California. Along with a forward by famous chef and restaurateur Alice Waters, the Davis Farmers Market Cookbook also features an array of colorful photographs of the market, its farmers, and the finished recipes, fully illustrating the magic of the farm-to-fork process. 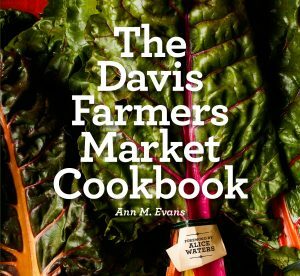 In honor of the 40th anniversary of the Davis Farmers Market, Evans released a newly revised edition of the Davis Farmers Market Cookbook in 2016, adding 20 farm-fresh recipes and a year of monthly menus tailored towards food-focused gatherings. This revised edition also introduces over 30 second-generation market farmers, highlighting their role in the community and giving readers a behind-the-scenes look at the Davis Farmers Market. Find your own copy Davis Farmers Market Cookbook at a variety of Davis and Sacramento locations, such as the Davis Farmers Market, Davis ACE Hardware, Davis Food Co-Op, Davis Avid Reader and UC Davis Stores in Davis, and Avid Reader Sacramento and Soil Born Farms in Sacramento. For those unable to shop locally, The Davis Farmers Market Cookbook is also available online through UC Davis Stores and Amazon.com. The Davis Farmers Market runs year-round on Saturdays, 8 a.m. to 1 p.m. at Central Park in Davis, California. The Wednesday market is divided into two seasons: “Picnic in the Park,” 4:30 to sunset from mid-March to October, and “Winter Market,” 2 to 6 p.m., November to early March. Two smaller markets run at the UC Davis Quad, Wednesdays 11 a.m. to 1:30 p.m. during fall and spring quarters (April through early June), and at Sutter Davis Hospital, Thursdays 10 a.m. to 1 p.m., May through October.